It's two days until May and my mom's flower pots have snow in them instead of flowers. It might be the first time I've heard this in Utah, but our mountains really don't need anymore snow. This spring has been so weird that I'm interested to see what the summer is like. All I know is that this weather is affecting my mom's ability to plant her garden, which means my ability to benefit from her garden is being compromised. That is not a good thing. When my parents moved to their current house almost seven years ago, I remember my mom being worried about all the birds that had been accustomed to being fed by her. It didn't take long till the new house had just as many birds benefiting from my mom's love for them. In this shot alone there are over 30 birds. My mom should have stock in bird seed. 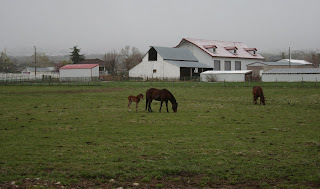 On the way to my parents today I passed a field with six baby horses. 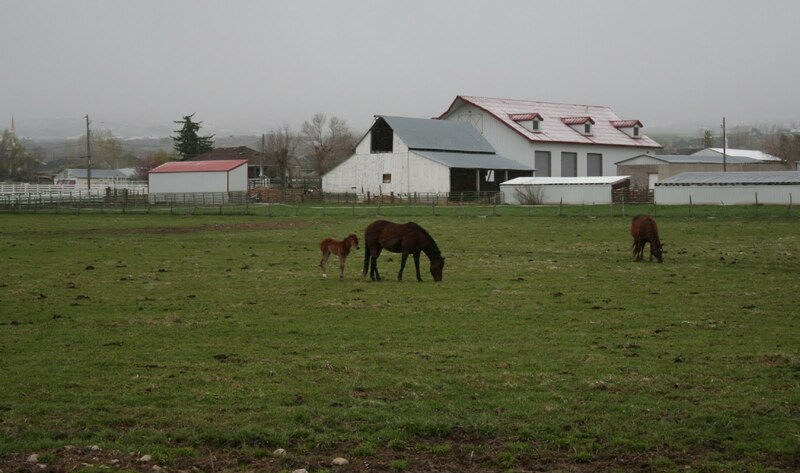 Fields of baby animals are one of the best parts of spring but I felt bad for them as the snow was rolling in. And on the horse subject, this horse lives down the street from my parents. When you walk by he comes running (trotting? galloping?) to the fence hoping you have a treat for him. This was the best picture I could get because he kept trying to eat my camera strap. Today I stopped and gave him a little grass and as he was leaving he started bucking and then did the horse equivalent of jumping in the air and clicking your heals. It was seriously the weirdest thing I've ever seen a horse do. I think he may have had mud in his hoofs, but who knows. And on an Easter note wrap-up, one of Will's Easter gifts was a Star Wars watch like the one my little sister's roommate has. Will's favorite part of it, the fact that you can actually attach Lego's to it. Cause this is the most useful watch I know I have ever seen. No, not enough things on your wrist? How about adding another clone so the other one has someone to battle? And yes he had to change into his Star Wars pajamas before he could wear the watch. I think that it was very fitting that I finished this book the week of Earth Day, because it is a great reminder of our connection to the earth. Or at least the kind of connection I want in my life. 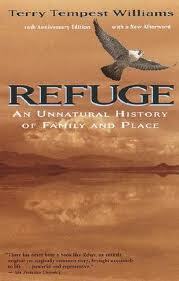 Refuge was written starting with the flood of the Great Salt Lake in Utah in 1983. The author, Terry Tempest Williams' place of refuge was the Bear River Migratory Bird Refuge on the northern end of the Salt Lake. The refuge was completely flooded and abandoned during the flood years. The same year that she lost her place of escape, she learned that her mother was dying of cancer. This book is a very personal, very touching correlation between the loss of her natural comfort and escape, and the loss of her mother. This book has a lot of information about birds, a bit much for me actually, I think my mom would really enjoy that part of it. But it didn't take away from the things that I loved about it. There is a great chapter that compares the changes in bird species to a lot of issues in our society. "What makes our relationship to starlings even more curious is that we loathe them, calling in exterminators because we fear disease, yet we do everything withing our power to encourage them as we systematically erase the specialized habitats of specialized birds." One of the things this chapter made me think about was my friend Marty who has mentioned many times on his blog about the influx of chain stores in New York City. Some want unique, specialized options but for the most part we do everything we can to drive those kinds of businesses out of business. We seem to live in a society that doesn't understand cause and effect. From a discussion with a Kenyan friend "Because we have forgotten our kinship with the land our kinship with each other has become pale. We shy away from accountability and involvement. We choose to be occupied, which is quite different from being engaged. In America, time is money. In Kenya, time is relationship. We look at investments differently." This chapter talked about how the further we get from things like growing our own food, the less we see how our other choices in life affect the earth and those in our community. And how we get further away from being a part of a community. "What an African woman nurtures in the soil will eventually feed her family. 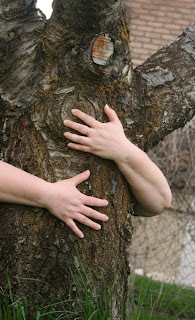 Likewise, what she nurtures in her relations will ultimately nurture her community. It is a matter of living the circle." By the end of the book, Terry becomes the seventh member of her family to be part of what she refers to as the Clan of One-Breasted Women. Terry loses her mother followed by both of her grandmothers to breast cancer, before having her own breast removed. Terry's family grew up in southern Utah which means that they were most likely exposed to nuclear testing which was done in the 50's. Terry was arrested at the Nevada Test Site as part of a peaceful protest with a group of Shoshone women. 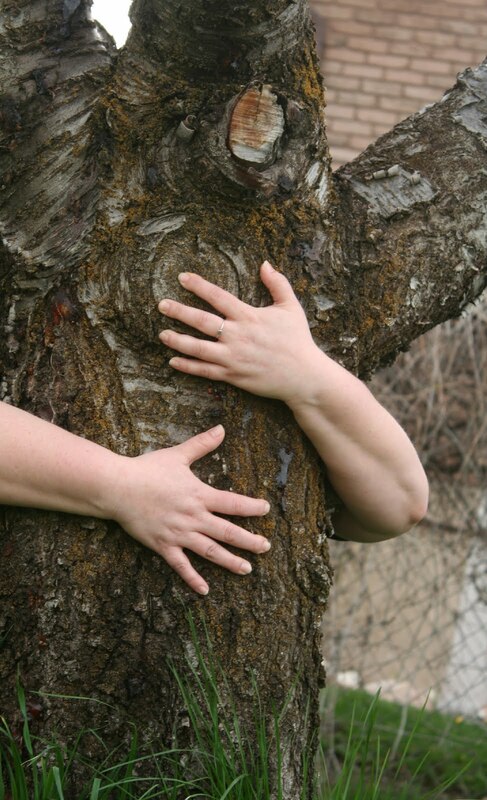 She feels that women in general feel a need to protect the land for their future generations of children. If you feel a connection to the earth, or long for that connection, I think you would enjoy this book. The other odd timing thing about this book is the fact that the 1983 floods are all over the news. We have had an unusually wet spring and have an above normal snow pack. If the weather warms up suddenly, we will have flooding that they say could be compared to 83. I have a small river that runs through my backyard. I feel very lucky that the berms built along the river at that time, are still there, because I have never seen it as high as it is now. There are other areas that are already having to deal with flooding from the ground water being so saturated and rising. In one part of the book Terry talks about having their church service interrupted and everyone told to go home and change, and report to downtown Salt Lake City to help sandbag allowing the river to divert down the streets. 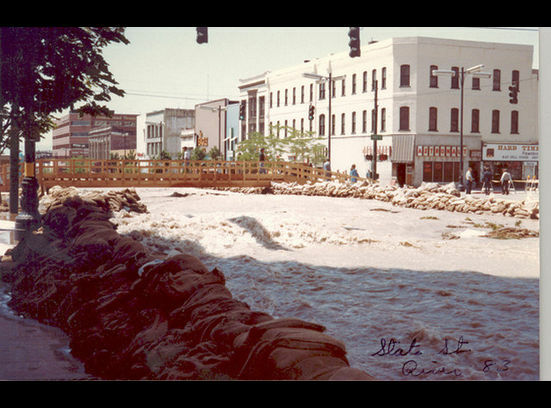 State Street was turned into a river during the flooding with a temporary bridge added for people to cross the street. These pictures have been on the news, so its been cool to see the photos associated with the stories I read. The part that has been really interesting about the floods being brought up again while reading this book, is the obvious cycle that things like this go through. And how we seem to forget that, or ignore it. Maybe because of our lack of connection with the land we live in. Most of the areas severely affected by the floods, have been built up, choosing to forget the past. We want the land to bend and change to our desires. But in the end, we will not have the final say. Nature will. I should really be in bed, but I'm on a good night high and wanted to write about it because I will have forgotten most of what I haven't already forgotten by morning. I need some memory work. My bff from high school Becky, asked if I wanted to go with her to a lecture by the artist Christo at the University of Utah. I won't pretend that I knew who she was talking about right away, but if you don't know him by name, you might know some of his work. He and his wife (who died in 2009) have been doing temporary installation art for 50 years. 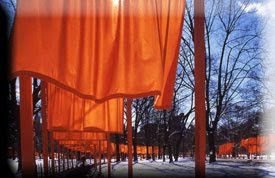 Most of their works involve large pieces of fabric draped or covering things. The most recent one in the US was The Gates in Central Park. 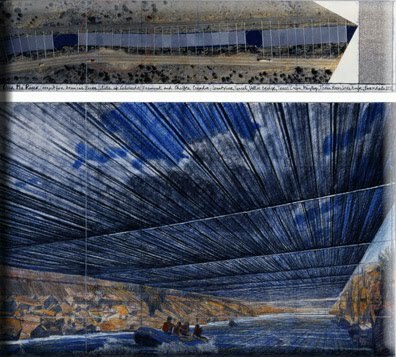 He is currently working on the approval process for Over the River in Colorado which will be six miles of fabric suspended above the Arkansas River. He is supposed to find out this month if they are approved to go through with the next steps in making it happen, hoping for completion in 2014. If it happens, I will do everything I can to go see it. 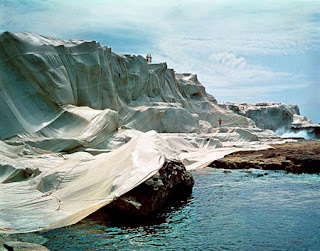 Christo went through a slide show of several works and explained the process that they go through. Most projects go through several phases of denial before getting permission to go forward. The Over the River project has been in the works for 18 years. But that's not even the longest. A project in Europe took over 26 years to get approved and went through two mayors being assassinated before there was one that would give the go ahead. 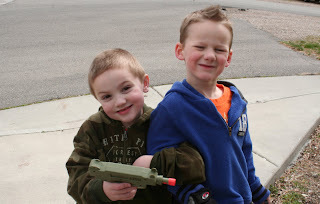 He pointed out that the assassinations had nothing to do with his group. The process for getting a work approved is extremely political. The Over the River project has even involved a specific chapter being added to the Bureau of Land Management code book specifically dealing with art, because no one knew how to address the situation. I wasn't expecting them to allow photos, which they did during the Q&A section, or I would have brought my nice camera. This was the best I could do, but we did have good seats. I could write a lot about what he talked about, but would probably be more than people would want to read, and its late so I'll just touch on a few points that stuck out to me. I wish I'd had a tape recorder so I could remember it all, but I probably wouldn't be able to understand most of it. For someone that has lived in the US since 1964, the guy has a very strong accent. First it was very touching every time he mentioned his wife, and partner Jeanne-Claude. Someone asked how they were able to work together everyday and the first thing he said was "love". 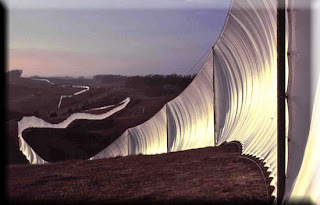 He talked about their different personalities that complimented each other even if they argued a lot about projects, but said that Jeanne-Claude would always answer that question with "If Christo had been a dentist, I would have become a dentist." If was very easy to see the combined passion they had for their work. And even if I didn't know much about the guy before tonight, its easy to become very interested in someone who has such a passion for their work. They do not do any commission pieces or accept any grant money or outside funding. All of their projects are funded through the sale of their art. They did not want to ever be influenced by someone else's ideas or visions for their projects. He mentioned that he could tell you a story about every piece they have done and the process of inspiration to do them. One person asked if there were any pieces that he wished could have lasted longer and stayed up. (they average being up for two weeks) He said no. He said that they reason they are special is because they are temporary. That there is a sense when you are there that you will never experience this again, and no one will. There are pictures and videos from each of the pieces, but it will never be experienced in that way again. That is one of the reasons they are so moving in person. And the reason I am now very eager to watch the progress of the Colorado project. The last question of the night was a student who asked what advice he had for young artists. Christo said he could not give him advice on art. He said that he never accepted an invitation to be an art juror because he never felt that he was in a place to judge art. He talked about how art should be something that you do because you need to. For you. That if other people enjoy your art, that is a great bonus. But the point of making art should be what you get out of it. The only advice he could give him was to do what you are passionate about, but that no one else can help you know what that is. Afterward while Becky and I were talking Becky, who is a high school photography teacher, said that her students really struggle when she asks them to do something new that is out of the ordinary. They want to know why, or what they will get out of it. They want an explanation for everything. They don't seem to understand doing something for just the experience itself. Those thoughts really stuck with me tonight. The idea of doing something just for the joy you get out of it, and doing something just for the experience of going through it, and just seeing what happens. I think those are ideas that need to be in my life more. After the lecture we walked across campus and got pizza at The Pie. I've never been there before and I think I have a new favorite pizza place. Awesome. And the one we went to is a cool underground bar with walls covered in graffiti. I think often that I would be happier living in Salt Lake. And then I convince myself that its just a perception and it wouldn't be that different. And then I go do something there and realize, no, its just a cooler place than Utah County. Cheers to a night of old friends, good food and inspiration to experience life. One of the many benefits to living close to my parents, is being able to regularly benefit from my mom's amazing cooking. I've mentioned them here before, but one of my family's new favorites is tamales. There are two things that make my mom's tamales better than most I have ever tried. First, seasoned masa. The masa can be very bland on its own and seasoned it adds just that little extra flavor. Second, is the masa to meat ratio. A lot of times with tamales you can have a bite where you wonder if there even is meat in it. My mom has the perfect ratio for the blend of the masa with the meat. Will has recently discovered their goodness after finally being willing to try them last month. Every night since then that we have gone to my parents, he has asked if we were going to have tamales and so we had them again this past weekend. He likes them so much we are going to have to narrow down his birthday meal this year because I told him he couldn't have salmon and tamales. And now a picture path of the making of tamales. I've been saying that if I had someone to make them for, I might actually attempt making them on my own. Guess that time has come. I realize I'm probably a weird parent for taking a photo of this. Will was riding bikes with his best friend Landon last weekend and a group of older boys came by with their bikes. Will got ditched by his friend for the cool older kids. 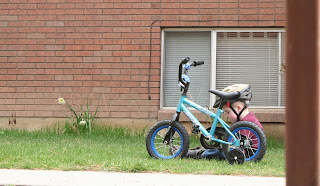 It was one of the moments as a parent when you realize that as much as you'd like to be able to, you're not going to be able to protect your child from the pains of growing up. So I sat back and watched. And took photos. The moving truck is here, Landon's family is moving several hours away this weekend. I'm really going to miss their family. Its been so nice having someone for Will to play with just in the next building. They spend every weekend running back and forth between our places and its something I'll miss as much as Will is going to. It's also the first time I've had neighbors that I actually felt comfortable going and borrowing eggs or butter from when I was short in the middle of a recipe. We've gone through a lot of neighbors while living here, I'm hoping these guys won't be the last great ones. I have a new restaurant on my favorites list, Downtown Philly Cheesesteaks. Oh man they are wonderful! The bread is amazing, the meat is great, the peppers, onions, cheese, just a perfect combo. I would have taken a photo of my lunch, but I'm too embarrassed to do such things. But trust me, awesome. And to make it feel a little more like Philly, they sell TastyKake and Pennsylvania Dutch Birch Beer (on tap and bottled), which is the best stuff ever. And my co-worker from PA has given his authentic approval. So if you are craving an awesome sandwich in Utah, try them out. And as soon as cheesesteaks become good for you, I will be visiting weekly. Just a wrap up of some random other pics from the trip. I always have to get a picture with the fake cop because I find it amusing. At least he was in a different spot this time. Tibetan food. Wow did it take a long time, but it was delicious. I've never liked the desert. I prefer green mountain valleys. Recently I got a package from a girl that lives in Kansas. She mentioned in her letter that the longer she has lived in Kansas the more she has come to appreciate it for what it is, instead of disliking it for what it isn't. Instead of focusing on the fact that its not beautiful mountains, she focuses on the expansive fields of sunflowers in the summer. I feel like that statement really applies to how I'm trying to change my feelings about the desert and see the beauty that is there, instead of just wishing there were aspen trees everywhere. We didn't get the chance to do much sight seeing or hiking on this trip, but I was still able to see some beautiful areas just by climbing the hill across the street, and on the picnic visit at my sister's work. And my baby sister Alex just got a job there too, so bring on the Best Friends love!